I was a pretty big fan of Tredici Enoteca when I reviewed it a few months back. And I continued to like the place even after the review was done (which is by no means a sure thing). But one of the few things I never understood about the place was why it didn’t serve lunch. It just seemed like a lock–a natural thing for a place that already does small plates and snacks and half-pours of wine, in a neighborhood with dense foot traffic and plenty of hungry people. Yes, they added on a brunch service in April, but that’s not really the same thing, is it? So imagine how happy I was when I got the news this morning that Tredici had (quietly) rolled out a daily lunch service on Monday, October 24. The new lunch menu is a combination of favorites pulled off the dinner list (bacon-wrapped dates stuffed with Manchego and bleu cheese, the broccoli and avocado with black sesame seeds and Dijon vinaigrette) and some new plates put together by the kitchen just for lunch. And while none of them strike me as particularly groundbreaking (though the tuna “tartartine” is kind of a clever twist on the avocado toast that some people seem to be so obsessed with these days), this is lunch so they don’t really need to be. There’s a burger. A chicken sandwich. Bacon and avocados are all over the board. But the best thing about this service? 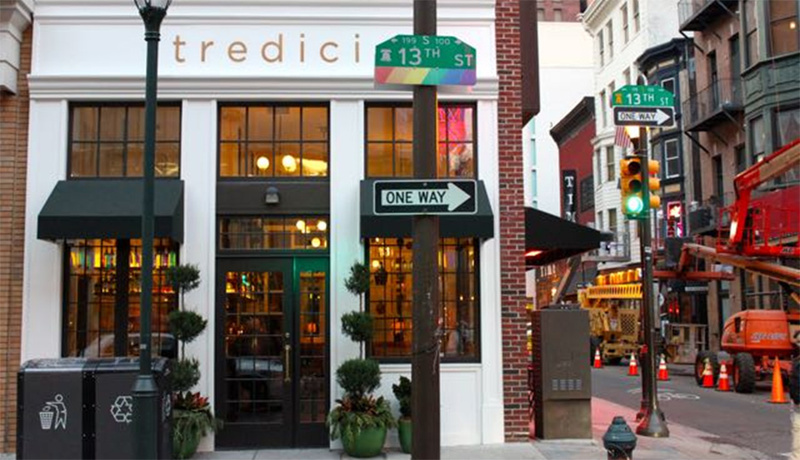 It runs straight through from noon until 4pm, when Tredici officially opens for dinner. Lunch service started on Monday, so you can go there tomorrow and check it our for yourself.